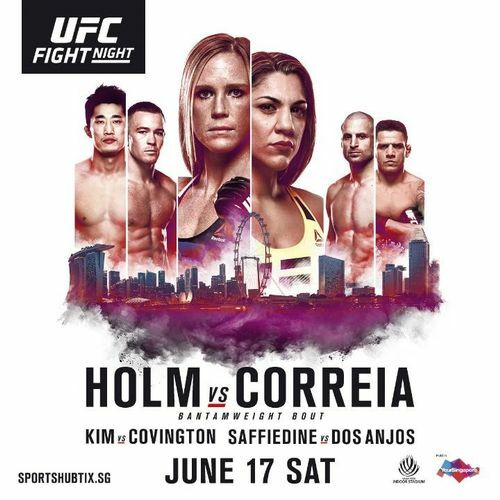 UFC® makes its highly anticipated return to Asia with UFC Fight Night® Singapore: Holm Vs. Correia. Headlining the card is a dynamic bantamweight bout between former champion Holly Holm and No.10 Bethe Correia. Other fights on the card includes Rafael dos Anjos’ welterweight debut against Tarec Saffiedine, as well as a mouth-watering clash between Dong Hyun Kim and Colby Covington. Tickets to UFC Fight Night® Singapore: Holm Vs. Correia are on sale and will be available for purchase online at www.sportshubtix.sg, the Sports Hub Tix Box Office, Sports Hub Tix Outlets at all SingPost locations, and by calling Sports Hub Tix Hotline at +65 3158 7888. Early bird promotions will end on May 7.